Our product range includes a wide range of u shape kitchen, designer kitchen, island kitchen, l shape kitchen, metal kitchen and modern stainless steel modular kitchen. 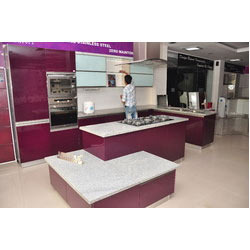 Keeping in mind the variegated demands and specific requirements of the clients, we have emerged ourselves as a trusted manufacturer, supplier and exporter of U Shape Kitchens. These kitchens are designed by using the world-class components and sophisticated technology methods. Our modular kitchens are high in demanded and praised by the clients due to their elegant look and classy patterns. We have gained rich industry experience in the field of manufacturing, supplying and exporting a large array of Designer Kitchens. 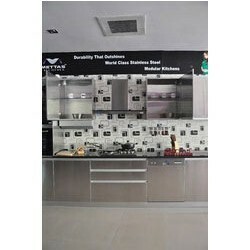 Available in several specifications and models, these kitchens are developed by adopting the latest technology methods. Our modular kitchens are designed in attractive ways that they offer the ease of usage and all the kitchen works handled conveniently. We are ahead our competitors in industry for manufacturing, supplying and exporting a wide range of Island Kitchens. These kitchens are artistically designed as per the latest market trends and changing demands of the industry. We offer our exclusive range at most economic rates and in many of the specifications. These kitchens are highly sophisticated and require less maintenance. 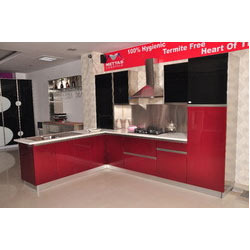 We have emerged ourselves as a leading manufacturer, supplier and exporter of L Shape Kitchens. 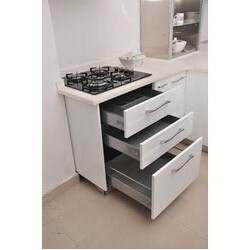 These kitchens are designed and developed in adherence with the industry standards. Our range is designed into many of the specifications that meet individual requirements and demands of the clients sufficiently. These kitchens are available at most affordable rates for our valuable and esteemed clientele. 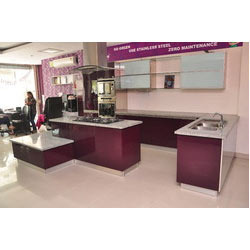 As per the specific requirements and variegated demands of the clients, we are engaged in providing the best and cost effective solution of Metal Kitchens. These kitchens are designed in such a manner that they offer the facility of multiple cabinets for the arranged and well managed utensils and other kitchen accessories. 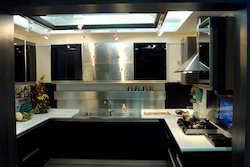 Our kitchens are easily installed and designed in accordance with the specific requirements of the clients. We offer an organized Modern Stainless Steel Modular Kitchen which makes cooking easier and is less time consuming. It consists of multiple wardrobes. It is Eco-friendly and safe to use. We manufacture supreme quality stainless steel modular kitchens that have no adverse affects on the environment and the people using it. It can be recycled and is pollution free and it has a longer service life. Looking for Modern Kitchen ?